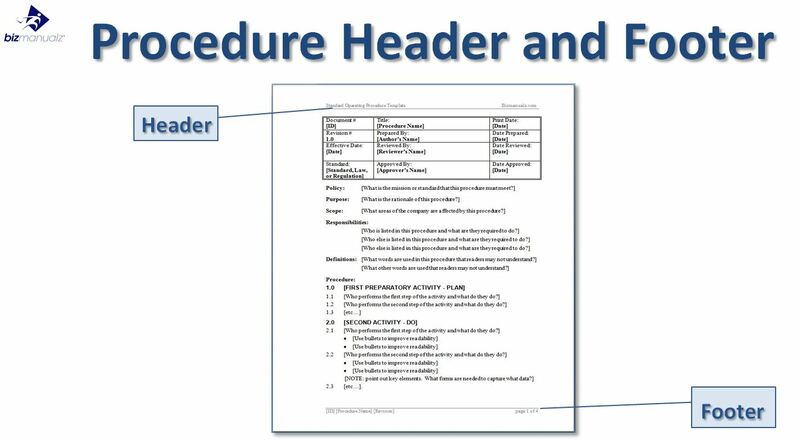 Writing Standard Operating Procedures, also known as an SOP template, will allow you to standardize your procedures, get started quickly, and provide fast, easy answers to common Standard Operating Procedure (SOP) questions. 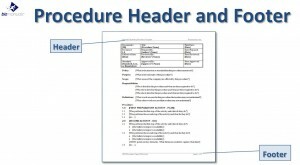 An SOP template will communicate to everyone the procedure format you want to use. It will provide a handy starting point so you don’t have to stare at a blank page. And will save everyone a lot of time selecting the font, margins, outlining, and answering questions about your company SOP structure. Using SOP accounting as an example, when you use our accounting standard operating procedure template you will easily be able to add in your own company’s policy on keeping records, but keep the standard policy on returned goods, or vice versa. Why Write an SOP Template? SOPs are used within a variety of industries ranging from manufacturing (for ISO 9000, AS9100, ISO/TS16949, OSHA), health care (JCAHO, ISO 13485), FDA (ISO 22000, GMP), Information Technology (ITIL, ISO 20000, CoBit), accounting (Sarbanes-Oxley, GAAP, IFRS), or Human Resources (ADA, FMLA, EOE, FSLA, etc). In fact, so many industries use standards that there are too many to list. The world is awash in standards. Perhaps if everything always executed as planned then we would not need procedures, but this is not the case in the real world. An SOP or Standard Operating Procedure is used to ensure business processes are well thought through, that each task in a process is performed the same way every time, and important data is recorded, along with errors or deviations so corrective action can be taken. When we use procedures we allow ourselves to learn. We use procedures to plan out process expectations (Plan), collect data (Do), check the data against our expectations (Check), and then take corrective action (Act) on what we have learned. This is the learning loop or PDCA in action. PDCA is the basis of process learning. Standards are developed to shorten the learning. Why wait for people to get hurt in the factory? OSHA Standards foster safety learning. OSHA SOP procedures communicate safety expectations. OSHA maybe for safety yet the same principle applies to all other standards or regulations. Standards are intended to speed up process learning. 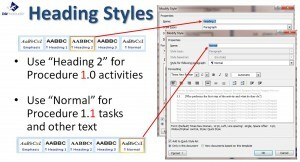 First, create your SOP Template in MS-Word. Most people Create a Standard Operating Procedure Template in Microsoft Word, but you could also use OpenOffice or another word processor. Give it a common name like “SOP Template” for example. 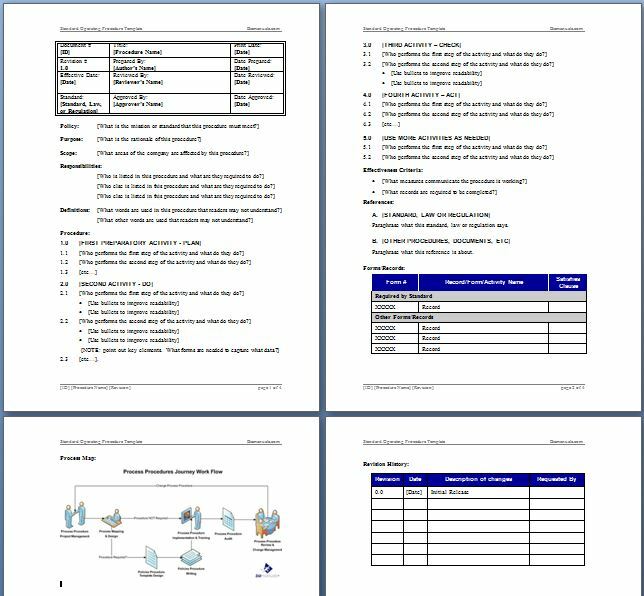 Download the MS Word file: “Standard Operating Procedure Template“ we have created as a start to developing your own template for policies and procedures. Second, start your SOP format with a control block, header, and footer. The control block can be a simple 3 x 4 table, which is used to house the document control information required for configuration management and compliance standards (see Procedure Document Control Table). Your header prints in the top margin and is a good place to put your company name. Your footer prints in the bottom margin and is a good place for the name of your procedure and page numbering. 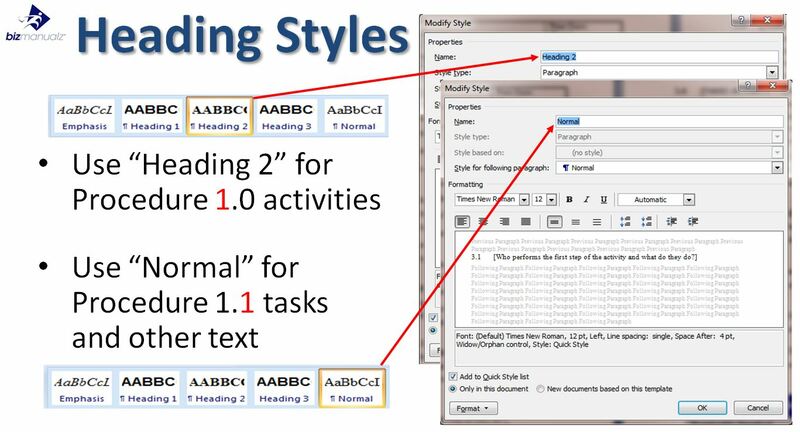 Finally, finalize the styles and fonts you want to use, any bolding or special treatment, and the margins you want to standardize on. Publish your SOP accounting template on your local server. Now that it is published you will need to let everyone know that you have completed your Standard Operating Procedure Template that you want everyone in the company to use for every procedure that is written. That’s it. Standards speed up learning within various industry segments just like SOP Accounting Templates speed up learning what to write. Many business processes share the same characteristics. And while not all business processes are exactly the same, many are similar enough to learn from and model to write your own procedures for your business. SOP Templates provide a standard starting point. So the real question is Why NOT Use SOP Templates. Using procedure templates save time, provides an opportunity to learn from experts, and helps you meet various standards, fast. 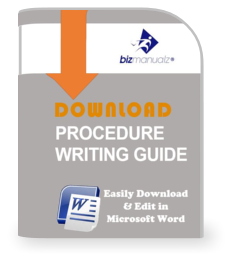 Procedure templates from Bizmanualz provide a consistent writing style across departments. Review free sample procedure templates to see for yourself how easy and fast it is to customize the MS-Word templates for your business. No other company provides a complete set for your whole company. I am in education sector and need to write SOP on my company, need your help. Most of our procedures are focused on business. We do have an article on “What Is Quality Education?” you can view. I would recommend the business sampler, which contains 111 procedures of general business nature that can be customized for education. There are 100 procedures to choose from that can help you get started.